Step into your home away from home in the Smoky Mountains, overflowing with so many amenities it’s Almost Heaven. 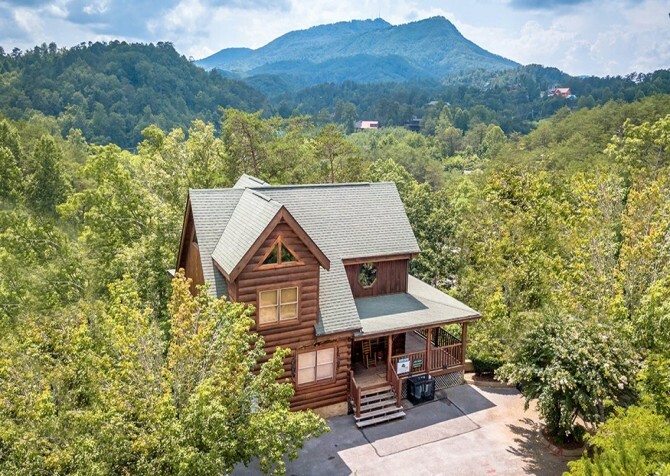 Located at Bear Creek Crossing, a resort in Pigeon Forge, this 4-bedroom, 4 ½-bathroom cabin sleeps 10 and features a TV in every bedroom, a fun rec room with an arcade unit and pool table, and access to both an indoor and an outdoor community swimming pool. Sip a warm cup of cocoa on the porch swing, bake cookies in the fully equipped kitchen, host a barbecue party with the gas grill, watch your favorite film on the 55-inch HDTV, and soak for as long as you please in the outdoor hot tub — the options are endless! Boasting tons of natural light and plenty of floor space, get ready for a dance party in the living room! Just want to relax? Lounge about with your friends on the 2 sofas for a leisurely chat or rest easy in the 2 arm chairs for a good read. Better yet, pile loads of savory snacks and unbelievably sweet treats on the large coffee table in preparation for movie night on the big screen TV (DVD player provided)! After the hero saves the day and gets the girl, turn on the electric fireplace to set the mountain mood. Whip up homecooked meals in the fully equipped kitchen — complete with dishware, cookware, silverware, drinkware, and stainless-steel appliances. Grab a glass of orange juice from the fridge, rinse some fruit in the double sink, and scramble a few eggs on the stove for a healthy breakfast. Make a quick lunch microwaved Italian leftovers, toasted garlic bread, and a soft drink. For dinner, blend a spinach pesto to go with your family-favorite recipe and a local bottle of red. Don’t forget coffee and cake for dessert! Or you can keep it super easy and have meals catered (check out Chef Jeremy with Savory Solutions) for your group in the cabin! Making mealtimes a breeze is the conveniently located dining area just off the kitchen. Featuring a large wooden table for 8, set out all your side dishes to make seconds easier for everyone. After the food settles, clear the table for arts and crafts with the kids or chat time with the grownups. Head to the rec room for game time! With a ceiling fan to keep things cool, let the gaming throwdowns begin. Play a few rounds of pool, beat the highest Galaga score on the arcade unit (featuring 62 games), and watch the latest sporting event on the 55-inch HDTV. If the little ones seem a bit antsy, pop a Disney classic in the DVD player to keep them entertained. Don’t forget to bring along a few decks of cards and board games to really get into the playful spirit — there’s even a table with 2 chairs for just such an occasion. As a bonus, another electric fireplace and a CD player await to enhance the gaming ambience. Shamelessly jam to the beat as you effortlessly take down your foes. With a flatscreen TV in each bedroom and enough bathrooms for guests to have their own space, it may be hard to decide who sleeps where. While there are 4 bedrooms total, 2 with king-size beds and 2 with queen-size beds, the master suite on the second floor may be worth fighting for as it comes with a few extra amenities. Take a bath of luxury in the jetted tub, watch a romantic comedy on the HDTV, prop your feet up on the ottoman for a comfortable rest in the arm chair, read a book of thrills and chills by the electric fireplace, and travel to dream land on the spacious king-size bed. Featuring a flat, paved driveway, park your car and head only 6 steps up to the deck for a turn on the porch swing or rocking chairs — complete with pillows! Make evenings delicious with freshly grilled meats and veggies on the gas grill and nights special with a relaxing soak in the outdoor hot tub. After a day or frolicking in town, a hearty meal and soothing wooded views is just what you’ll need. As if the amenities couldn’t get any better, this cabin is a proud member of the Bear Creek Crossing Resort, giving you access to indoor and an outdoor community pools! Spend the day sunbathing by the pool, splashing with your kids, and putt-putting to victory. Provided for your convenience, utilize the washer and dryer to leave room in your suitcase for a hefty load of souvenirs. There’s even an ironing board to make your clothes extra snazzy for date night. Want to post a few photo albums of your in-town activities? With the complimentary high-speed internet, uploading will be easy as pie. Ready for a downtown adventure? Grab the kids and gather your friends to head into Pigeon Forge for a day of entertaining activities, delectable food, exciting rides, and out-of-this-world fun! Filled with tasty eateries, quaint shops, incredible games, and the Great Smoky Mountain Wheel, The Island is a place you will treasure on your mountain trip. Spend an entire day at a Dolly Parton amusement park for roller-coaster screams, musical feats, endless play, tasty treats, and shopping all day! Get ready to see the mountains like never before aboard the Smoky Mountain Alpine Coaster, where you decide how fast you fly!